Ω Go see in the News to participate in the contest !!! Our project is to develop the combination of two sports. Riding out & mountain bike trails. 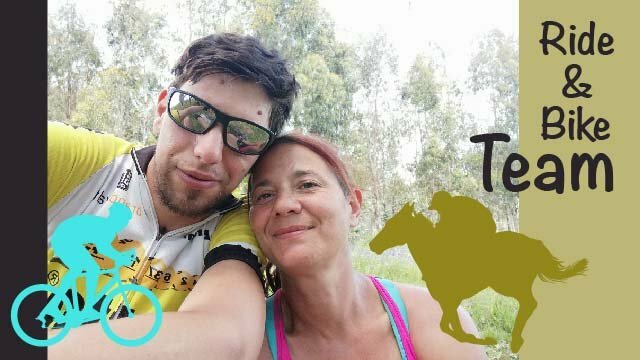 I am Barberine Duvivier an equestrian guide in Portugal for 5 years now and my friend Miguel Tomaz is a mountain bike cyclist guide. Often cyclists and riders are not always on the same wavelength, yet we have the same affinities in terms of practicing our sport in the wild to discover sites that are generally not easily accessible by other means. We have four horses trained for horseback riding and treks & two mountain bikes. We took advantage of the summer to develop our project and test the Ride & Bike. Nature lovers, we have with our students and our visitors, combined the love that we carry to our respective sports, by practicing together Ride & Bike, with respect and attention. 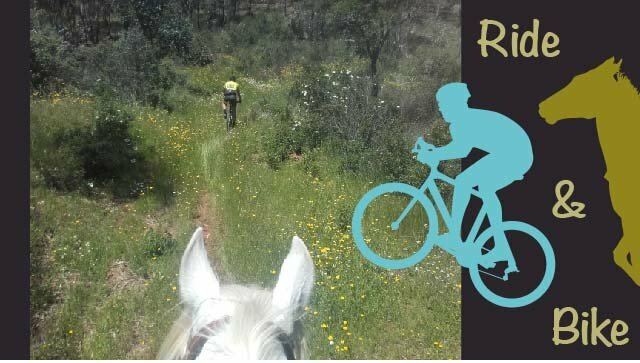 We practice Ride & Bike activities in the beautiful Serra d'Ossa in Estremoz which are well known mountains for cycling mountain bikers and also a great terrain for equestrian rides. Estremoz is located in Alentejo in Portugal at the same latitude as Lisbon but on the side of the Spanish border. We wish to promote the practice of these two sports disciplines practiced in unison, with enthusiasm and conviction. Once the goal is reached, the next step will be to put our RIde & Bike experience at the service of the pilgrims. ​By offering them the possibility to follow the paths of Santiago de Compostela from Estremoz. 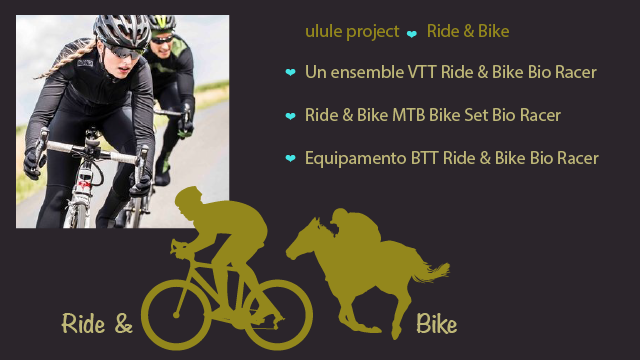 To continue to carry out our project, we need a minimum of 3 additional moutain bikes that we plan to buy in second hand as the previous mountain bikes, as well as equipment such as MTB helmets. To make it short, it would be really cool and generous of you to support us in our action. We could buy better quality bikes, for example lighter carbon MTB or e-bike easier for less trained athletes. We would print "Ride & Bike" MTB jerseys and shorts as sports equipment. We would have a promotional budget to inform and promote the practice of Ride & Bike. We could offer a little bit more luxury to the horses, greener hay, better rations, ray-grass, vitamins and other supplements, an equine dentist, an equine osteopath. Because horses regularely climbing the mountains are also athletes. Always loving horses, Barberine Duvivier is now an equestrian guide in Portugal. She arrived in Portugal a little bit by the hazards of life and fell in love with this beautiful country, these people and more particularly its region, the Alentejo. For a long time, she dreamed of her project Ride & Bike, which she kept warm in a corner of her head. 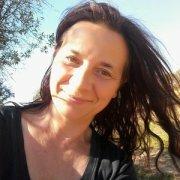 And then, always the hazards of life ... She moved to Estremoz at the foot of the Serra d'Ossa, very famous in Portugal to delight mountain bikers. At the same time, her pregressant Portuguese, she meets Miguel Tomaz Cycliste VTT. Together, they go to discover the Serra and the adventure Ride & Bike is born. The Ride & Bike is a discipline that may seem simple by the idea or the name, but needs to adapt to the needs of the other. Because the horses are slower in the descents and faster in the climbs. It is therefore necessary to constantly adapt to the practice of the other. 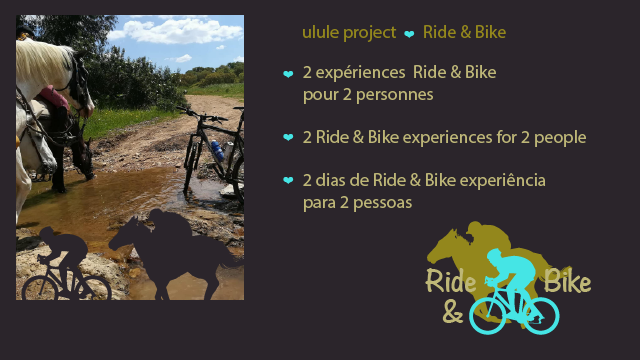 The Ride & BIke also has its small advantages, for example, horses can carry lunches and relief supplies for cyclists in the saddle-attached cast irons and cyclists can easily clear the paths and go on a frontier exploration. Regularly, Barberine Duvivier received requests from riders asking her so that could well make the non-rider companion during the stay, the answer she knew, the Ride & Bike, but she was not able to put this in place at this time moment there. Following their meeting, Miguel Tomaz joins the group of mountain bikers of Serra d'Ossa and travels the mountains with them. 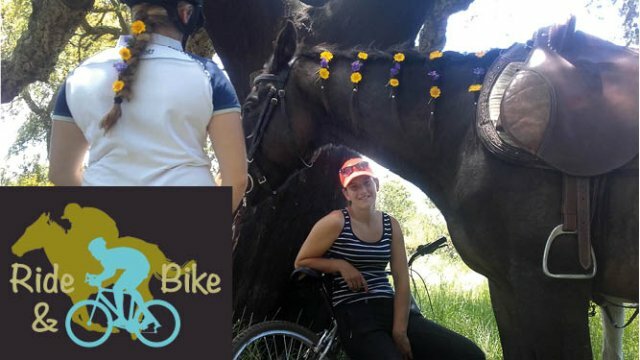 Barberine, having reduced her number of horses in order to take better care of her cavalry, she decides to buy two used MTB to start the Ride & Bike project. 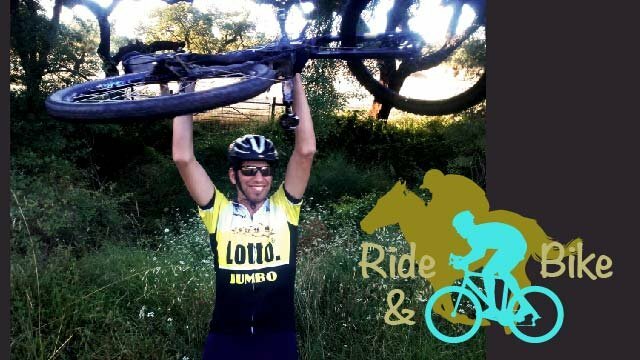 Although referred to as the Ranch do Novo Mundo, she decided not to lose the fruits of her hard work and first created a new Facebook page for the Ride & BIke. Well-deserved break for the horses, the bikers and the riders. 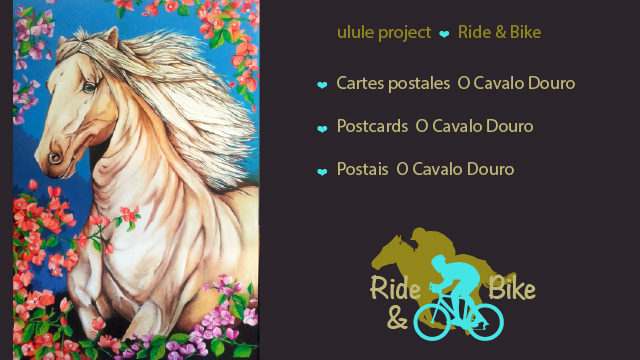 Our thanks and 3 postcards "O Cavalo Douro" limited edition for the campaign ulule for each 5 euros. 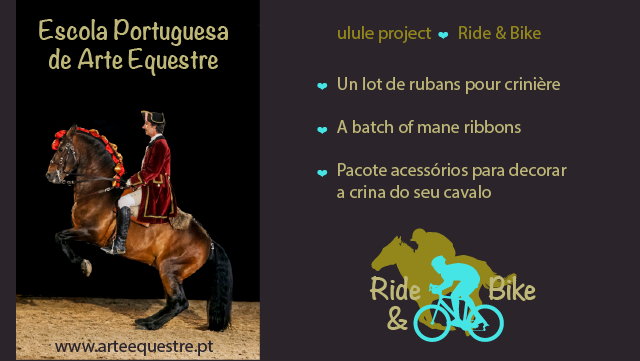 Receive at home a lot of ribbons to decorate the mane of your horse like the Alter Real horses of the Portuguese School of Equestrian Art. We will contact you to choose together the desired combination according to the colors available. 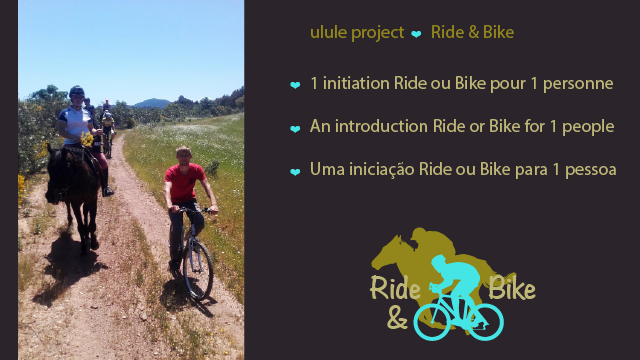 We offer you a Ride or Bike initiation voucher, an equestrian iniation or mountain bike initiation for one person. Voucher not nominative and valid until the end of 2019. 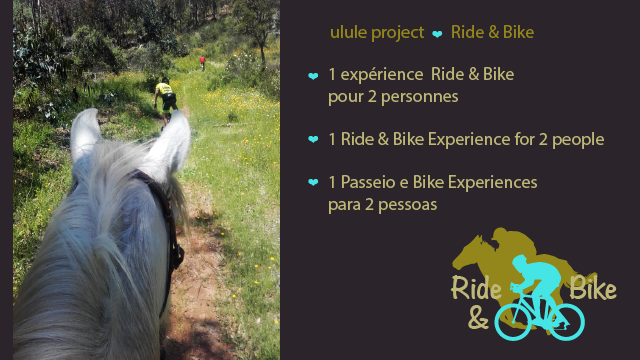 Ride & Bike experience for 2 people in Estremoz. + 5 postcards "O Cavalo Douro" and a big thank you. Voucher non nominatif and valid until the end of 2019. 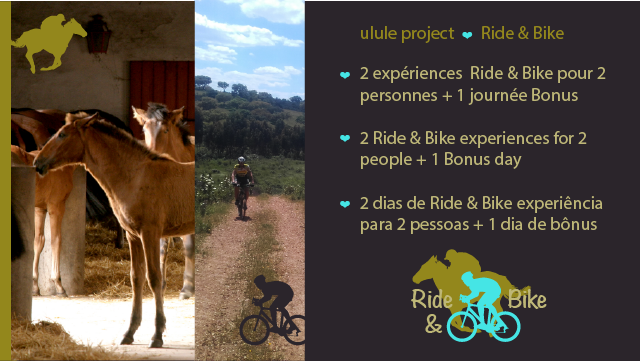 We offer you a 2 half-day voucher Ride & Bike experience for two people in Estremoz. + 5 postcards "O Cavalo Douro", and a very big thank you. Voucher non nominative and valid until the end of 2019. The voucher does not include stays and meals. Rider : a day at the Coudelaria Alter Real breeding the famous Lusitanos horses of the kings, with a lesson of riding on the spot. Cyclist : an surprise day in Serra d'Ossa. And a super big thank you. Voucher non-nominative and valid until the end of 2019. The voucher does not include stays and meals. A jersey and matching shorts Ride & Bike, pro quality made by Bio Racer. + 5 postcards "O Cavalo Douro" and a huge thank you. We will contact you at the end of the campaign to specify with you the information needed for the sports package. 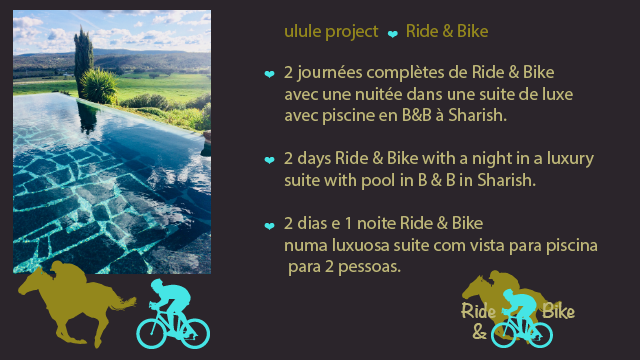 2 days Ride & Bike with a night in a luxury suite with pool in B & B in Sharish. 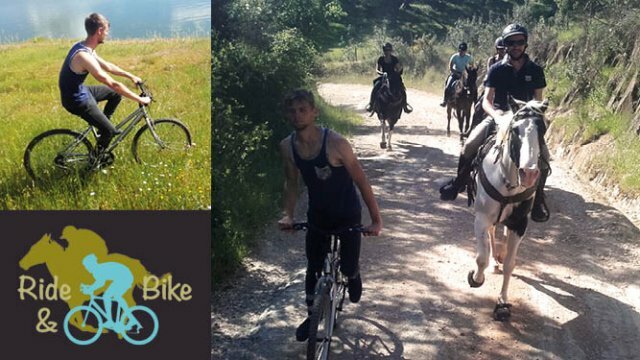 We offer you a voucher of 2 days of Ride and BIke in the Serra d'Ossa for two people with a night in Bed and Breakfast in a superb suite in Sharish Monte das Estevas. And a giant thank you. Non nominative voucher valid until the end of April 2019.